Father, why would you lead me to Michelangelo? Bear with me as we look together through this window. It happened so long ago that I was taking photos with film. Now I take digital but then - it was a different ball game. This is a shortened version of the story with an expansion that happened more recently. I wanted more photos. I kept turning it on and off, suddenly it was working again. I took photos of other statues. However, I would always remember shot 25 at the end of that first roll. At home, I could hardly wait. I had the film printed immediately. In an unusual move, I asked for double prints. Shot 25 looked like a double exposure with a male angel above the female angel - yet it couldn't be. I knew God was in it. I would have a big print made. I checked the film strip and the lab had trimmed the last shot too tight and cut off the head of the male angel. I didn't have the negative. But I did have double prints. Dancing with Jesus is an adventure - the evolution of this painting is too long a story for here. However, What demands our attention . . . are the following revelations the Lord wove into the painting. I found photos of "David" in the library, but not from the front view. We have a DVD of the movie "The Agony & The Ecstasy" - about Michelangelo painting the ceiling of the Sistine Chapel. I decided to watch it. To my surprise, before the movie they showed Michelangelo's work and panned the sculpture of "David." Yes, the face of the male angel has some resemblance to "David." The answer came as I sat quietly in the His presence. God to stretch them into His vision." When one person will yield their gifts to the leadership of the Holy Spirit, He can do a work that will change the world for centuries to come. Michelangelo stayed the course. He paid the price . . . 4 years of diligence to paint the ceiling of the Sistine Chapel. It became his greatest achievement. Now . . . You run your Race ! 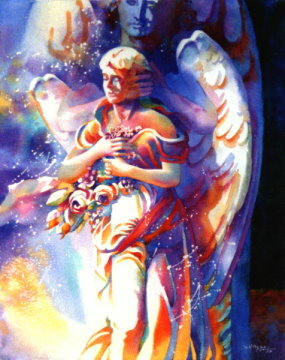 The male angel is above the female angel. His image is suggested. His arms are around her in a position of protection. One day as I was looking at the painting, the Lord revealed a before and after that He had woven into the design.
. . . worried but on the path.
. . . Dancing with Jesus.
. . . is stories of dancing with Jesus. Now, the Michelangelo story . . .
Father is that a face from Art History? When I asked a friend, a college instructor who taught Art History, he said the male angel reminded him of the sculpture "David" by Michelangelo. This is the Father's book from the front cover to the back. He gave the painting for the front cover. Revelation like light comes forth through that painting, revealing inspiration that only He could give. Like a master weaver He puts in more than you can see and then chooses the moment to shine light on new revelation. God has so much to reveal to us when we listen. 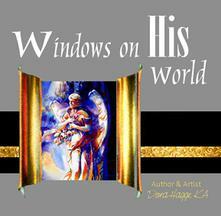 His revelations are windows of Himself that we are privileged to look through. Painting for the Lord is like dancing. Do you dance? It is teamwork. A personal relationship with Jesus is like dancing. When you are dancing, your partner cannot make his next move until you follow him on his last move. I initiate the dance by believing Scripture and speaking it out loud in faith. Proverbs 16:3, KJV says, "Commit your plans to the Lord and He will establish your thoughts." I speak that Scripture out loud and commit my plans to Him in faith. Jesus is moving, performing His Word. Now He is establishing my thoughts. Now it is my move. "I hold onto you for dear life, and you hold me steady as a post." Jesus is the Word. Hold onto the Word and Jesus will hold you steady as a post. Does it line up with the Word? God never violates His Word. If it doesn't line up with the Word of God - throw it out. Period. Don't put a question mark where God put a period. Colossians 3:15 in the Amplified Bible says that we are to let the peace of our hearts umpire all our decisions. Proverbs 3:17 says that all wisdom's paths are peace. The Holy Spirit is faithful to give you peace. No peace, can't settle down, then - throw it out. If it lines up with the Word and you have peace - Now you move out and take a step and go dancing with Jesus. His move, your move, His move, your move. The dance became part of every day. 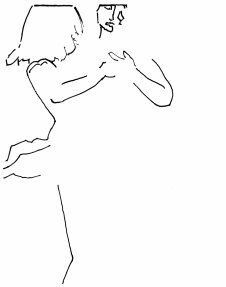 The dance became part of all the things I do every day - not just painting. I wasn't consciously aware it was happening. and to speak the Word out loud - to send it in front of me. The desire of my heart is to allow Jesus to be all He can be in my life. I speak the Word and go dancing with Him . . . and He does things like giving this painting and then telling me to write this book - and that the painting is for the front cover. - and setting Him free to take me into His higher vision. This is not an excerpt from the book. The revelation regarding Michelangelo is in the book, but the dancing with Jesus revelation came after the book was published. Copyright Dora Hagge. All Rights Reserved.